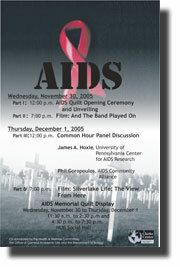 A series of events to mark World AIDS Day. Co-sponsored by the Office of Campus Academic Life, Department of Biology and the Health and Wellness Committee. Part II: 7:00 p.m. Film: And the Band Played On – A story of discovery of the AIDS virus. From the early days in 1978 when numerous San Francisco gays began dying from unknown causes, to the identification of the HIV Virus. Part III: 12:00 p.m. Common Hour Panel Discussion – The science and policies surrounding global and domestic AIDS. James A. Hoxie, University of Pennsylvania, Phil Goropoulos, AIDS Community Alliance. View Bloodlines – a 20 minute documentary developed by two young women who contracted AIDS followed by a discussion led by Philip Goropoulos ’97, CEO and president of AIDS Community Alliance. Part IV: 7:00 p.m. Film: Silverlake Life: The View From Here – Winner of over 10 International Awards, including the Grand Jury Prize at the Sundance Film Festival. An extraordinary video diary of living with AIDS. The film documents, with guts and with humor, the love and dedication of longtime companions Tom Joslin and Mark Massi as they both live with the fatal disease. According to the Centers for Disease Control, in 2001 alone, HIV/AIDS related illness caused the deaths of nearly three million people worldwide, including almost 580,000 children under the age of fifteen. Since 1997, roughly 13.9 million people worldwide died from HIV/AIDS. In 2003 alone, over three million men, women, and children from around the world died of AIDS, with central and southern regions of Africa reporting 15-35% of the population infected. Rates of infection and mortality show uneven pattern. While they are spreading at an accelerating rate in certain parts of the world, they are holding steady or gradually declining in others. A sustained educational campaign about infection and the use of life-sustaining drug medications are the two main factors behind this decline. It is imperative, therefore, to expand the campaign’s reach to stem the spread of this killer disease. Dr. James Hoxie is the director of the Penn Center for AIDS Research and a professor of medicine at the University of Pennsylvania in the department of hematology and oncology. His primary research interest is focused on identifying viral and cellular determinants that are relevant to the ability of HIV and SIV to infect cells and to evade host immune responses with the hope that this information will be useful in designing vaccines. Dr. Hoxie earned an M.D. from the University of Pennsylvania in 1976 and a B.A. in biology from Wesleyan University in 1972. He specializes in the medical aspects of leukemia therapy and bone marrow transplantation, and is the director of the Penn Center for AIDS Research. in non-profit management from Regis University.